When our son had accompanied me on our trip to India in 2012, we stayed at our ancestral home, inherited by my younger brother (a Syrian Orthodox Christian tradition, also followed by most Christian households in Kerala), wherein the youngest son inherits the ancestral home and along with it the responsibility to look after the aging parents. This could be because he is the one most likely to outlive the parents as in the olden days marriages were consummated at an early age and the prevalence of deadly diseases with poor healthcare, in some cases the parents outlived their children. We spent a few days there and our son, prowling around the backyard, was trying to place the tamarind trees, jack-fruit trees, breadfruit tree, chicken pen, cow shed etc (almost all of them have disappeared now), based on all the stories I had narrated to him about our growing up days. He suddenly found a stone, looking more like a ‘Shiva Ling’ as per his perception and knowledge of Hindu mythology. He imagined that the earlier owners of the property could have been Hindus and they must have left the stone and our family might have stowed it away safely in the backyard. He called me out and sought my explanation about the origin of this stone. I explained to him that it was the ‘Aattu Kallu’, a circular base stone with a hole, six inch in diameter and depth, chiselled out to make space to put in soaked rice and lentils to be ground for making batter for Dosa and Idli. The cylindrical stone applies pressure while being manually churned around in the hole on to the rice and lentils, thus crushing it into a smooth paste. The kid could not grasp the entire operation as I could make out from his expressions. The only way to make him understand was to hold a demonstration (experiences in conducting lecture-demonstrations while in the army came handy). I requested my sister-in-law to soak some rice and lentils overnight for the demonstration scheduled next morning. Seeing his curiosity, I decided to introduce a few more items of interest. Outside the kitchen in the work area, there was the ‘Ammi Kallu’. I took him there to explain as to how the wet-grinding of shredded coconut and spices was done on a two feet by a foot rectangular stone platform with the help of stone cylinder of about six inches diameter and a foot in length. It is an art to move the stone cylinder over the platform without rotating it. Rotating the stone cylinder meant less pressure on the material to be ground and hence additional time spent. My sister-in-law was gracious enough to conduct a demonstration of its utilisation (after she kept aside the Sumeet Mixie), and I conducted the accompanying lecture. There is also an interesting cultural association. 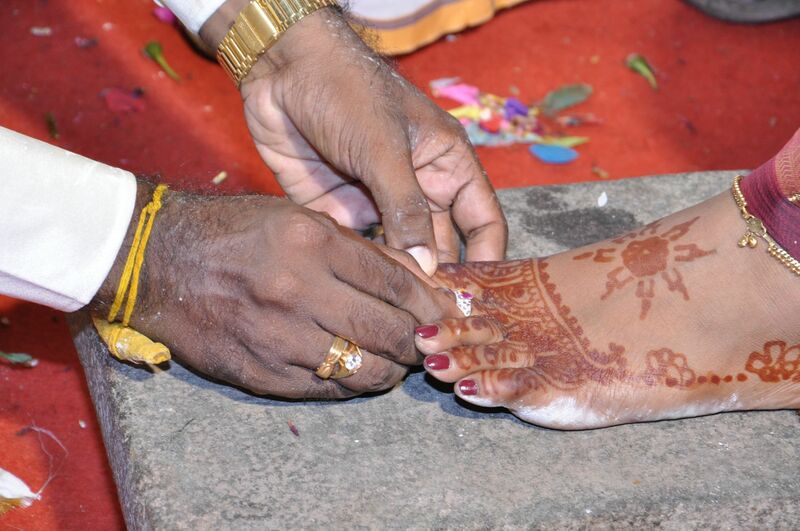 The Tamil Brahmin groom inserts the toe ring (metti) on the bride’s toes when the bride places her foot on the ‘Ammi Kallu’. It is believed that as per the Indian myths that the ‘Ammi Kallu’ is a magical stone, and the coconut and spices ground on its surface is believed to be healthier than the ones done in an electric grinder. In the corner of the work area was the ‘Ural’, unused for many years, given way again for the more efficient modern electric mixer grinder. Ural is again a stone cylinder about two feet tall and two feet in diameter. On the top surface, similar to the ‘Attu Kallu’, a hole, six inch in diameter and depth, chiselled out to hold rice, or coffee beans. De-husking of raw or boiled and sun-dried rice was done in the Ural. Powdering of rice or the coffee beans or spices was also executed here. It was strictly meant for dry grinding only. There is a five feet tall baton made of hardwood, with a metallic cover at the base, which is lifted up and pounded on the material inside the hole. Perfecting the art of not spilling the contents while pounding is developed over time – to start with for any learner, the speed of pounding is a bit slow, but with practice, the speed really picks up. In my younger days I have seen two ladies doing this in tandem. Real precision timing and coordination is required for each pounding, else it could spell disaster. With a small quantity of rice, I did a demonstration, but the contents did spill out. According to the Hindu mythology, one day Yashoda, lost her motherly patience after a few pranks by little Lord Krishna. To keep him quiet, she tied him to an Ural and went into the kitchen to attend to her chores. 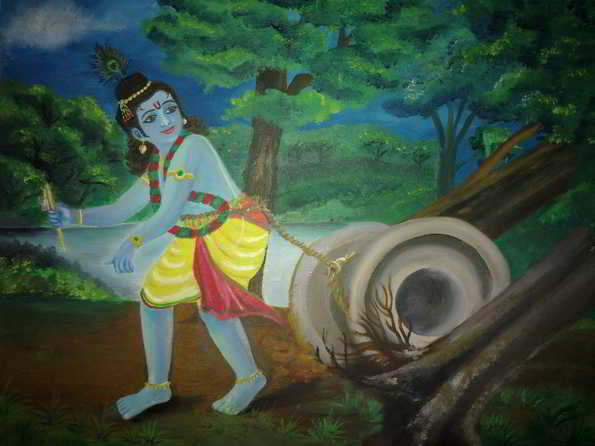 Now alone, Krishna dragged the Ural and passed between two large trees. The Ural got stuck between the trees and with one yank, he succeeded in freeing himself and also in bringing down the trees. The trees were in fact two Gandharvas (male spirits with superb musical skills, husbands of the Apsaras [beautiful, supernatural female beings]), who were transformed into trees by a curse by the sage Narada, with a condition that they would be reincarnated by the touch of Krishna. Next morning, we did the wet grinding practice; I demonstrated the activity and our son followed it up. Here again coordination is required to rotate the stone cylinder with one hand and push the material into the hole with the other. We used to take turns, in teams of two, one doing the cylinder rotation and the other pushing the material. I explained to our son that the secret behind the well toned arm muscles of his dad and the three uncles were courtesy these stone implements. Great narration ,,, it really takes us to those days ,,,very vivid description ,,,one can imagine as if every thing is happening in your presence ,,,there used to be an entirely different taste of meals prepared in those times ,,,that taste is long forgotten ,,,,Ural had multi functioning ,,,an indispensable item of any household then ,,,besides the use of Ural would keep the people physically ,mentally and spiritually fit and alert . Reji, very well elucidated. You took me back by decades where I had witnessed my mother & other ladies grinding batter for iddli in the evenings and keeping it overnight for fermentation. I had also helped in this activity. Yes, you have rightly said that our muscles developed those days. Remember drawing water from deep wells. Oh! I used to love this 2-in-1; drawing water & the associated exercise. The whole family used to savoir these baked and delicious iddlis. I used to consume about 20 iddlis at a time for breakfast. . This was in 60s when my dad was posted at Avadi. The ladies of stone age were generally more healthier when compared to ladies of Mixer / grinder days of today. Well this is evolution. With induction of modernization many healthy social traditions have deinducted. I loved this narrative. keep going. Best wishes. Reji, Very nicely written and explained. All of us have seen use of those items but none of us could have explained with demo like you. Great. Your knowledge of traditions and Hindu religion too is good and it was interesting article like any of your articles. Keep it up. Modern day high speed grinders are no match to these as the temperature and properties of ingredients do change in hi speed action and results in end product being not “my grandmother like product “!! As usual well written Reji, this is of particular interest to me of course ! well written. It brought me nostalgic memories of my amma, patti etc. using ammi, attu kallu and ural to make chutney, dosa/idli batter and also make broken rice. We also had some mechanical contraption to roast the green coffee beans and another to grind the roasted beans to coffee powder which chore I used to do during my childhood! 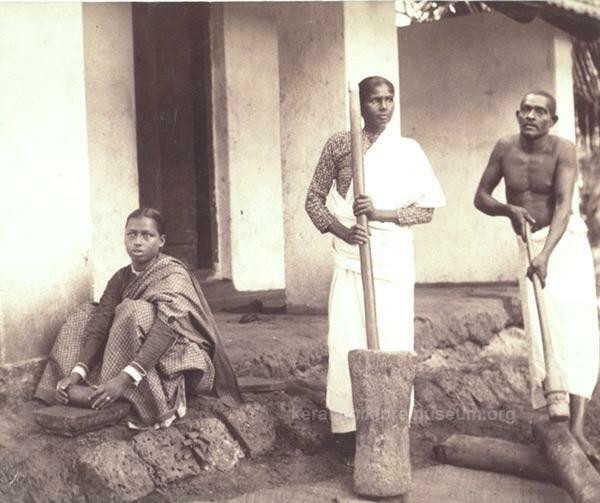 The ladies of yester years were more fit as they had to do so much physical work. Please note I am not against the modern gadgets, they have made life simpler but then people have to either do gymming or some other physical exercise to keep themselves fit. I too have used those stones in our very young days. Must say, they helped in building strong arms and coordination. Much enjoyed your stone age story! Reji , quite a treasure to re-live the days without electricity. Human beings were close to nature. Worth trying our daily chores and we can see the difference. I also find the practices did have a reason and one can actually find them .Very interesting info on the Theory of inheritance. GREAT NOSTALGIC NARRATION OF OUR PAST. Great narration and it did take me to nostalgic journey to our village home where all this equipment was used for flour, pulses, rice, wet grinding etc; all being done at home. It would be very difficult for todays kids to visualise those items and the way it was operated. Another good piece Reji. Brought back memories of trying to help my mum with the Attu Kal. great piece ! I have had the good fortune of using these ‘machines’, ‘first-hand’ .women keep up a non-stop lively chat (arattai) session going even as the eyes and arms go through the well-coordinated motion. Believe your are having very patient children. Most modern children don’t have patient to know about their elders life. Very well explained. Reji very well written. Lovely reading. Keep it up. Regards. Your writings can be made part of school syllabus. Think of it.